Through the MSP program, NSF awards competitive, merit-based grants to teams composed of institutions of higher education, local K–12 school systems and additional supporting partners (figure 1), which can include other stakeholders in educational excellence in the STEM fields. Math and Science Partnership Program, , 2010, WWW Document, (http://hub.mspnet.org/media/data/MSP_2010_Impact_Report.pdf?media_000000006722.pdf). Math and Science Partnership Program, Math and Science Partnership Program: Strengthening America by advancing academic achievement in mathematics and science, , 2010, <http://hub.mspnet.org/media/data/MSP_2010_Impact_Report.pdf?media_000000006722.pdf>. Math and Science Partnership Program. "Math and Science Partnership Program: Strengthening America by advancing academic achievement in mathematics and science." 20. 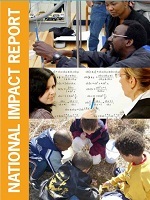 2010. http://hub.mspnet.org/media/data/MSP_2010_Impact_Report.pdf?media_000000006722.pdf (accessed 24 April 2019). Math and Science Partnership Program. Math and Science Partnership Program: Strengthening America by advancing academic achievement in mathematics and science. 2010. 24 Apr. 2019 <http://hub.mspnet.org/media/data/MSP_2010_Impact_Report.pdf?media_000000006722.pdf>.